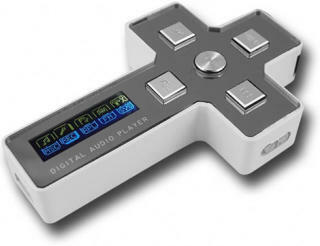 Chinavision, a wholesale electronics dealer famous for its startlingly worthless products (Skype Mouse-Phone, Handheld USB Paper Shredder, Laptop Cooling Pad), has decided to bring us a wonderful cross-shaped digital music player. Boasting 1, 2 or 4GBs of internal memory, a two-color LCD, a built-in speaker, a FM tuner, an integrated mic, seven equalizer modes and a multi-language menus, the crucifixion inspired MP3 is promised to make a “fashion statement.” Oddly enough, it was apparently designed to be given away at youth groups or while on a mission. It costs between $22.47 to $48.14, but you can save (zing!) even more by buying in bulk. If the manufacturers goal is to actually reach people for Christ perhaps it should come preloaded with some key verses spoken by a celebrity or something.